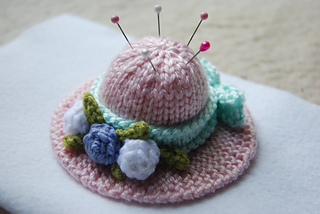 Christmas presents don’t necessarily have to have a seasonal theme and Jean therefore designed four elegant miniature ornamental hats, which can also be made as pin cushions. The Four Seasons Hats are trimmed with holly and feathers, tiny apples and flowers. Instructions are also given for hat stands so they can be displayed.